That almost sounds like the new parent “our daughter is 6 months old already” statement, but today it means we have been vegan for 6 months. Six months ago, John and I watched “Fork’s Over Knives,” the next day we became vegan, it has changed our lives. I can not believe how simple this lifestyle change was for us, not once have we faltered, knowingly. I am sure we have accidentally had something that wasn’t vegan, especially while eating out, they are so sneaking adding dairy to sauces, dressing, dips. But that’s okay. We have more energy, have lost weight, are happier, feel fantastic and I am amazed how powerful food really is. It’s crazy how our taste-buds and sense of smell has changed too. I can’t stand the smell of meat now, especially when it’s raw at the market, even fish is a bit on the nasty side for me. And yogurt (an old time favorite before) smells so nasty I can’t stand it when Kennedy (basically a vegetarian) eats it. How is it possible that a cheese loving, yogurt eating junkie now can’t handle the smell of either? Power of plants I guess. 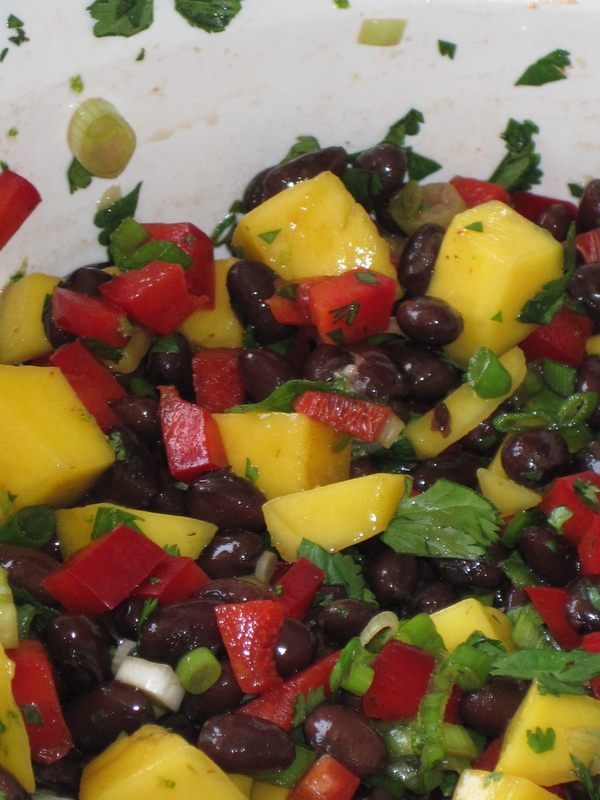 Below I am going to share a current favorite salad of ours, we all love this Mango and Black Bean salad. I found the orginal recipe on a can of black beans (I don’t remember the brand) and have tweaked it to be what we consider perfection. Combine all ingredients in bowl, toss and enjoy. i have been vegetarian basically for forever….going vegan has always sounded a bit “deep end” for me. You put it so thoughtfully, no crazy hippie speak, just down to earth real life. I have been battling weight issues lately, too little with the first round of chemo, so I was asked to “bulk up” for the third round….and I have been struggling to lose it now that I m healthy…maybe going vegan is the way to start. I don’t like to be “preachy” but if you haven’t watched “Forks over Knives” I highly recommend it. It is not at all deep end hippy stuff; just facts about how a plant based diet can change your entire life. Many people have completely reversed diabetes, heart disease, cancer, it’s amazing, John and I both watched our fathers loose to cancer, which is why we looked into diet changes in the first place.